Engineers, quality professionals, supervisors, metrology technicians. 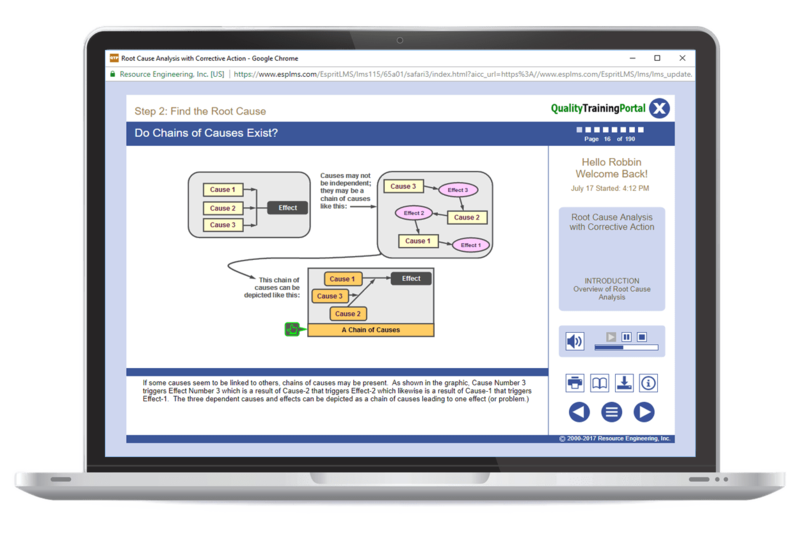 MSA (Measurement Systems Analysis) online training includes detailed tutorials on many measurement system analysis techniques including how to conduct and analyze GR&R (Gage Repeatability and Reproducibility) Studies. A GR&R is the accepted technique for evaluating the level of variation in a measurement system and determining if the measurement system is acceptable for use. Measurement System Analysis covers techniques for analyzing the variation within a measurement system, determining its suitability for use, and ways to improve measurement systems. The GR&R analysis techniques used in the MSA online training program are in compliance with IAFT 16949/AIAG methods. Once a measurement system is found to be acceptable, it is equally important to institute a formal system to manage the measurement system to ensure that it continues to be reliable and dependable. MSA explores approaches to managing measurement systems to ensure that they can be depended upon. To explain various sources of measurement system uncertainty. To conduct measurement system studies including assessment of linearity, stability, repeatability, and reproducibility. To define ways to improve measurement systems. To understand and implement a gage management and calibration system. A solid understanding of statistical measures of variation covered in Basic SPC and Advanced SPC or the equivalent. Experience with basic measuring concepts and an understanding of sources of variation in measurement systems such as what is covered in Gage Training or the equivalent. Gage Training – Comprehensive training in how to use a variety precision hand gages including an overview of basic measuring concepts, introductory blueprint reading, an overview of GD&T, and which gages to use when. A review of sources of measurement system variation. An explanation of Type A and Type B evaluations of measurement uncertainty. Exploration of the effects of too much variation on measurements. How to measure gage/instrument linearity (both graphically and mathematically) to determine if a gage (or instrument) has linearity problems. Taking action to deal with linearity problems. How to evaluate gage/instrument stability using a control chart. Taking action to deal with stability problems. How to conduct a GR&R study. R&R analysis for non-destructive measurements. Use of ANOVA for GR&Rs. R&R analysis for destructive measurements. R&R analysis for attribute measurements. Graphical techniques to analyze R&R. Using a problem-solving approach to find the root causes of repeatability and reproducibility problems. Using the GR&R data to help direct the problem-solving effort. A description of some basic causes to investigate if gage/instrument repeatability is high. A description of some basic causes to investigate if appraiser reproducibility is high. Suggested selection criteria for features of software programs for analyzing GR&R studies. An overview of some of the advanced measurement system analysis tools that a GR&R software package may have. Why a gage/instrument calibration program is so important and makes good business sense. Why a gage/instrument may not be accurate. The components of a gage/instrument management system. Measurement errors due to gage/instrument calibration deficiencies. Measurement error related to gage/instrument usage or damage. Errors of judgment resulting in measurement errors. GR&R issues and measurement error. A discussion of common calibration practices. Key elements of a calibration system as defined by ISO 10012-1. Sources for calibration procedures and independent calibration laboratories. Methods for determining intervals of calibration. Traceability of calibration standards from primary national standards to working standards. The role of transfer standards and working standards. Measurement uncertainty and the calibration system. Common instrument management system pitfalls. Proactive techniques to steer your organization clear of these pitfalls. Different types of records needed for a comprehensive instrument management system. The role of audits to ensure your instrument management system is working. Benefits of using instrument management software. Suggested selection criteria of software features for an instrument management software program. Use ANOVA and graphical techniques for the R&R analysis. Use the GR&R data to initiate action to improve the measurement device’s repeatability and reproducibility. Describe the primary sources of measurement error. Show how the calibration of a measurement device is tied to ISO standards. Specify your requirements for measurement instrument management software, if you choose to computerize your records.